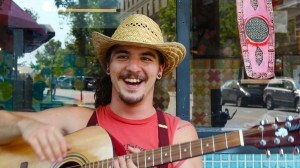 Charles Clyde Toney II is hardly a stranger to Busk Break. In fact, he’s one of the most documented performers in the series, thanks largely to one particularly fun evening of music on a very warm spring night this year, where he was joined by fellow buskers Kris Wahl and Eris Valentine. Until now, however, there hasn’t been a recording of Toney performing by himself. It was blistering hot out when I ran into Toney (joined by his friends Cody and Patrick) near the Woolworth Walk. After a few lackluster attempts at playing together as a trio, I asked Toney if he had a song he would play solo. He did. It wasn’t finished, but he figured he could make up any parts he didn’t have worked out yet as he played it. It’s a rare thing to encounter a performer who, knowing he’s being recorded and that his work will be released to the internet at large, is perfectly fine playing a song he’s only half-finished.